Remark : Please choose 2 size more bigger as it Korean size. Thank you ! Perfect!!!!!! Arrived in nine days to France! The pair is perfect and love. They are very comfortable, beautiful and is picked up the appropriate size advise buy at least two more, as my foot is the 38 size and ordered the 40 and is almost equal in size. Thousand thanks by this product! Recommend it. Thank you for awesome pair. It is most loved BTS Product I ever bought. Will buy more products. Shoes just as in the description. 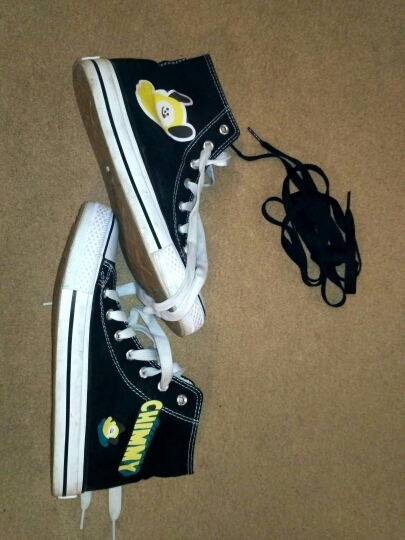 The Seller sent two pairs of shoelaces. The 37.5 ordered the advice of a 40, sister says, that is a good stock for the nose. Delivery took 11 days to Paris. After reading some of the comments, I bought them 2 sizes larger than usual and that was definitely the right decision since they fit perfectly now. My usual one would have been too small so I advise to take a larger size as well. Otherwise, they’re exactly like pictured and what one would expect for both the prize and type of shoes. Shipping was fast and without any issues. The packaging was simple but sufficient for this type of item. Bought them for a friend and she was very happy about them. Would buy from again. Product very much Advise to order two size bigger two size big, size fit Good. Recommend to every BTS lovers.